I bought the above cutters on the recommendation of a mate who owns a tackle shop in Holland. He was madly enthusing about them to a customer standing in front of me and in the demonstration he picked up a section of 4lb braid ( thinner than cotton) and was happily snipping off 1 and 2 mm sections. After seeing this I decided that I had to have a pair and I have to say they are just that good. 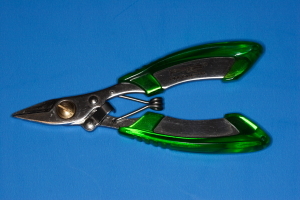 If you want a pair scissors that will cut almost anything ( including the shank of a hook apparently – though I have never tried) and then go back to cutting fine braid, these are for you. Normally when a really successful product appears on the market other tackle manufacturers are quick to leap on the band waggon and product their own version. Strangely PB products are still the only manufacturer that supplies this kind of cutter. Verdict – buy them I have had them for 1 season and they are still as sharp as when I bought them. They can go from snipping wire traces to snipping fine braid and never miss a beat. Buy a set for each tacklebox they are that good.